A man has walked 200 miles to join a march in London in favour of another EU referendum, engaging with Brexit supporters along the way. Ed Sides set off from Swansea two and a half weeks ago and has "taken time to listen as much as talk". 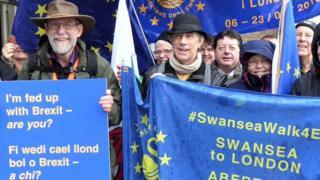 Wales for Europe had booked out 30 coaches to transport protesters to Saturday's demonstration. But one Leave supporter said a fresh vote would just prolong the arguments for another three years. Others from across Wales made their own way to Hyde Park for the march. Mr Sides, who was joined by his wife Rhiannon Barrar for part of the journey, set out on foot from Swansea on 6 March. "I set out on the walk to raise attention to our cause, but also to prove that just because you're passionate about something it doesn't mean you have to rubbish opposing opinions," he said. "We need a kinder, more rational debate about Brexit, and everywhere I've stopped I've taken the time to listen as much as talk." Welsh Government ministers Vaughan Gething and Eluned Morgan were among the many politicians joining the march in London. The UK had been due to leave the EU on 29 March, but that date has now been put back to 12 April, as MPs try to find a way forward. Prime Minister Theresa May's exit deal, negotiated with the EU over two years has been voted down twice in parliament, once by a record margin. MPs are now divided on what direction to take next - some want to leave without a deal, others want to not leave at all, and some want another referendum. In the 2016 referendum, Wales voted 52.5% to 47.5% in favour of leave, a slightly higher margin than the UK as a whole at 51.9% to 48.1%. But Peter Gilbey, director of the anti-Brexit campaign group Wales for Europe, believed the mood had shifted over the past three years. "Those who were ardent Remainers are probably more so now, and likewise with Leavers, but equally those who were uncertain in 2016 are even more confused than ever," he said. "The argument that a second referendum would be a betrayal of the people makes no sense; how can more information and more democracy equal less democracy?" However, retired Swansea builder Fred Jones, who voted Leave, told BBC Wales he found arguments espoused by some Remainers patronising. "I wouldn't say that I'm passionate one way or the other, but I am fed up of being told I voted Leave because I am in my nineties, or because I'm stupid and didn't know what I was voting for," he said. "I knew full well that leaving was going to cause upheaval and hardship in the short term, but would eventually allow Britain to decide for ourselves what sort of country we want to be. "But the main reason why I don't believe in another referendum is that it will solve nothing - we'll be having the same arguments in three years' time."